Mutant RFP from Discosoma striata (coral) (Part:BBa_E1010) with added LAA-ssrA degradation tag (Part:BBa_M0050). The tag increases RFP turn-over rate, thus providing better temporal resolution of red fluorescence. In the same time, maximal fluorescence amplitudes will be lower as newly formed protein is degraded as soon as it is formed. The tag encodes peptide sequence AANDENYALAA and is recognized by ClpA and ClpX unfoldases and ClpX mediator SspB. ClpA and ClpX then form a proteosome-like complex with ClpP protease and the protein is degraded (Figure 1). 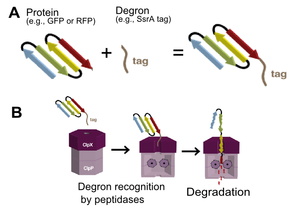 The final three residues of the tag determines the strength of interaction with ClpX and thus the final protein degradation rate. The LAA tag is E. coli wild type ssrA tag and is reported to lead to very fast protein degradation, degrading GFP with rate -0.018 per minute. However, be aware that exact protein degradation rate depends on multiple factors: ClpXP and ClpAP protease and SspB mediator concentrations; protein stability; Km of binding to the protease; temperature .